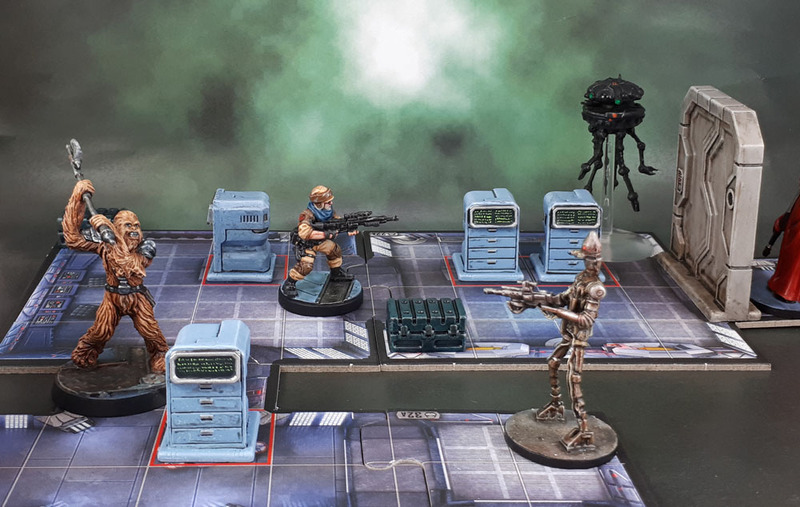 Mantic Games | Azazel's Bitz Box. 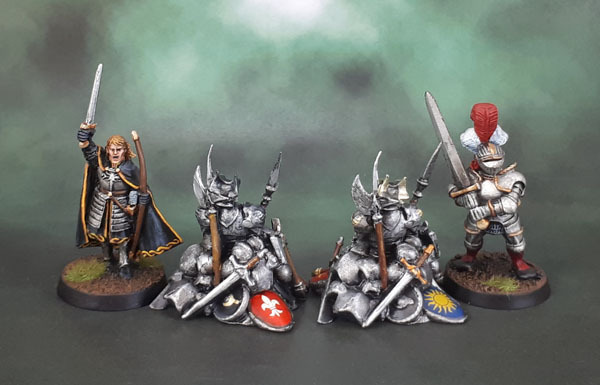 I don’t like to post twice in the same day (going by my own timezone, anyway), but I wanted to get that Warhammer Humble Bundle out there when I saw the S&B write-up this morning. This is the post I’d planned to have today, and since it’s a bit of pretty meh stuff, I’m happy to get it up now to get it done with. Another bit of Mantic Terrain Crate fodder today. A trio of very simple pup tents that I got in their first Kickstarter campaign. As with most of the rest of the stuff from this campaign, they’re simple pieces, fine for what they are. 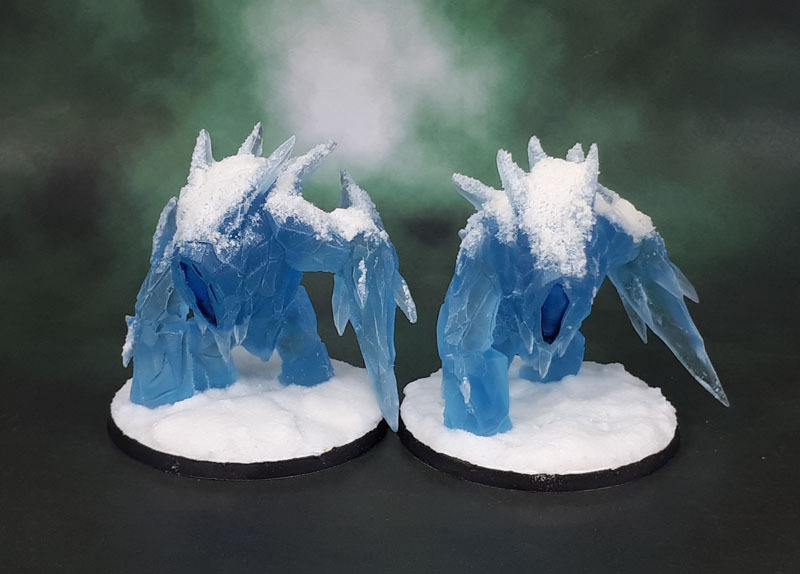 Now that they’re painted, they’ll make for a small bit of unobtrusive terrain in a variety of games and settings, and should fit in pretty easily with the similar stuff I got from Renedra awhile back. My plans to get a ton of exciting Heroes and Villains done in December have had a few large wrenches thrown in the works, and as a result, I haven’t really painted for almost a week. 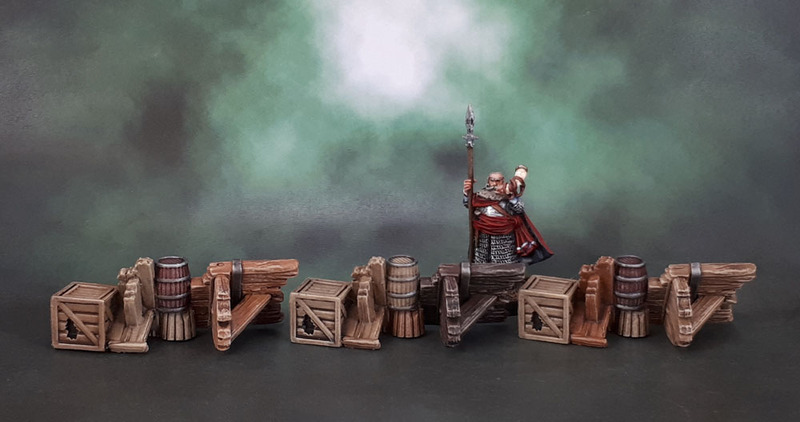 Getting back into it, I decided to work on some simple stuff that had been sitting around in the way on my painting desk – in this case, more Mantic Terrain Crate scatter pieces. Two different types of barricade – and three of each. I varied the colours just a little in order for them to be a little unique and not just look like clone-pieces. 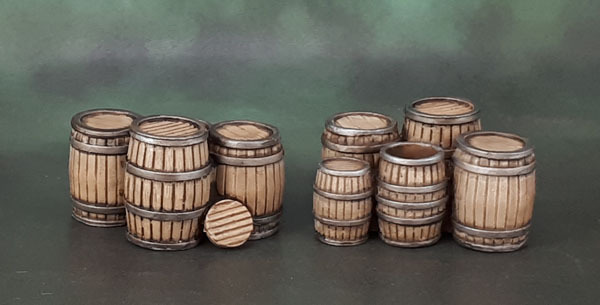 I kept them all to natural, “woody” tones, and this time I varied the crates and barrels a little from the tones I’ve used in previous sets. As you can see, they’re not exactly scales as proper barricades – more in a boardgame scale, if anything. Our model here is Forlong the Fat, one of GW’s “true-ish”-scale, LotR models. Even though he’s positioned behind them and is raised by a slottabase, you van see that they’re not exactly very big as far as barricades go. I’m sure they’ll be fine as generic scatter, though. 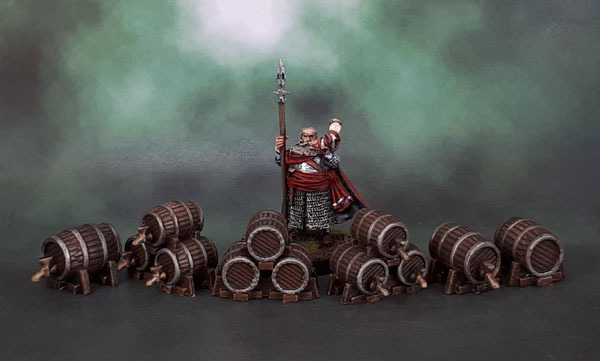 The other pieces are much less interesting – three larger keg barrels and three sets of triple-keg barrel stacks. Dark wood here, with brassy taps. 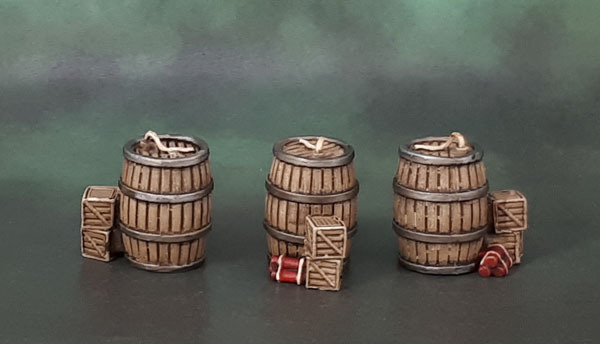 While the barricades will easily make a bit of extra colour in fantasy wargames as well as dungeon scenery, these keg-barrels are a fair bit more limited. If we ever need to kit out a tavern for a game, we’ll certainly have a well-stocked booze supply! Finally, some chests that I made myself finish off, after they’ve been sitting around for 6 months or so. These are from the Conan Miniatures Boardgame, by Monolith. 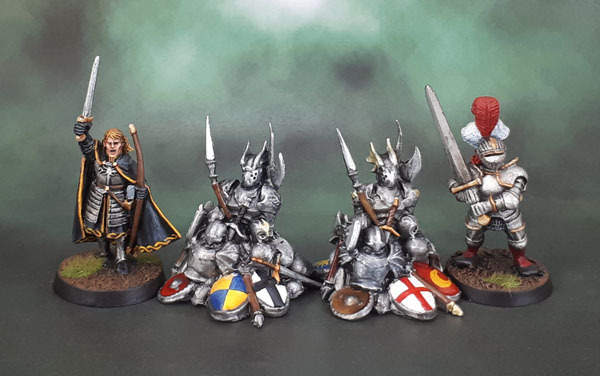 I remember some time ago in the comments, someone (Dagger & Brush, from memory) suggesting that I could paint some of the chests in a set I had in different colours to distinguish the quality of them. 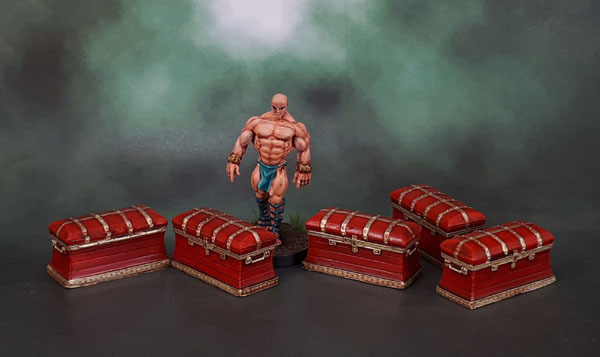 Rather than paint the same model chests in different colours, I decided to make these slightly more fancy coffer sculpts a little more fancy in turn when it came to their paint. Baal Pteor, also from the Conan game provides us with our scale in this shot. 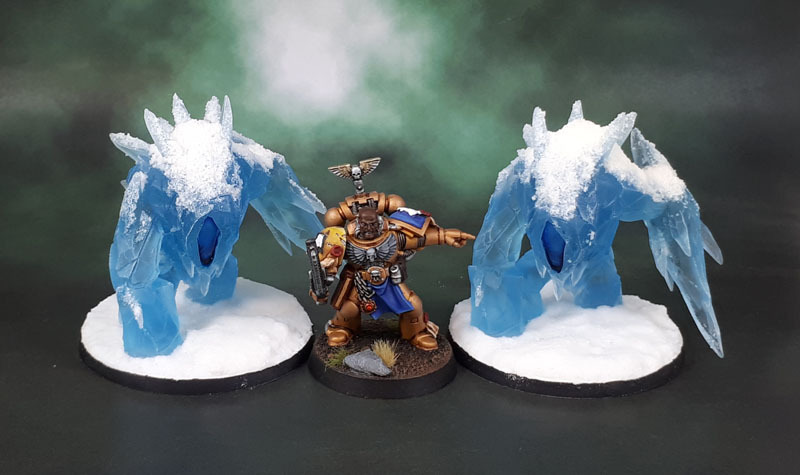 I’ll have some real models painted for you all. Soon. 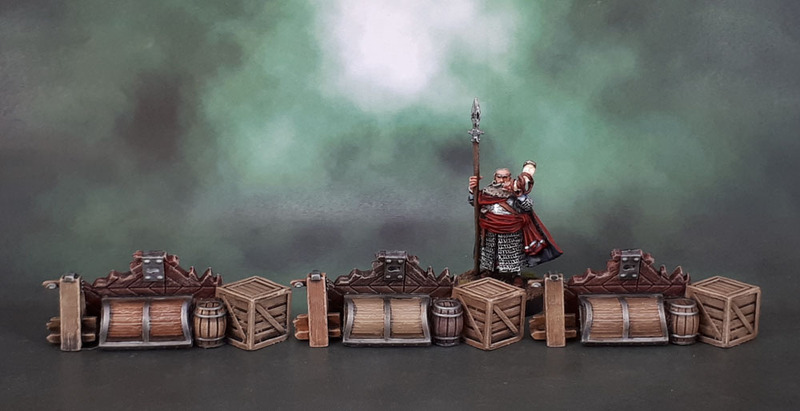 Mantic Terrain Crate – More bits of painted scatter: Treasure Piles and Armour Stacks. A bit of an intermission post today. I’ve already spent a few hours assembling the Community Round-Up post from November, and with luck it’ll be done tomorrow. I’ve got 10/17(18) people’s stuff done so far. 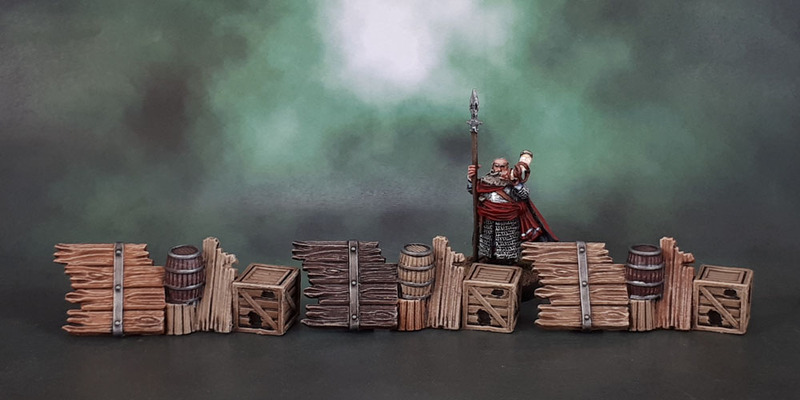 Anyway, here’s some (more) bits of simple scatter from Mantic Games’ Terrain Crates. Beregond of Gondor and an unnamed Reiksgard on foot provide us with scale. First up are the treasure piles. Useful for Role-playing, and perhaps games like Frostgrave. 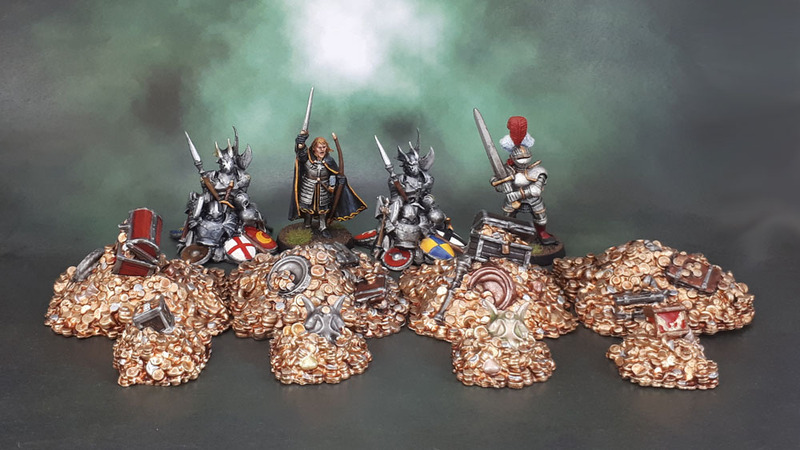 I’ve attempted to make them just subtly different from one another, and I’ve painted the odd coin silver in the piles to give them a fractionally less uniform look. Kind of like when you pick out the odd brick when doing a brick wall. Something often not directly noticeable because it looks more natural. I may add some gemstone paints to the armoured breastplate-things in the front middle two. Not sure. Any thoughts? Finally, a couple of more detailed shots of the armour stacks. The PVC is thin and bendy, and my heat-resets didn’t stick. Yes, I could replace them with wire and so forth, but as with many of these things – they’re not worth the time it would take to do so, especially since these took WAY longer for me to get finished than I’d originally intended – about 2 months, when I’d hoped for a weekend – that’s what happens when something is pretty much “meh” in terms of how much it excites me to paint. Adding wire to them would just make all of that even worse and further dragged out. In the end, they look decent with the paint and the decals – and most importantly of all – the bloody things are done! 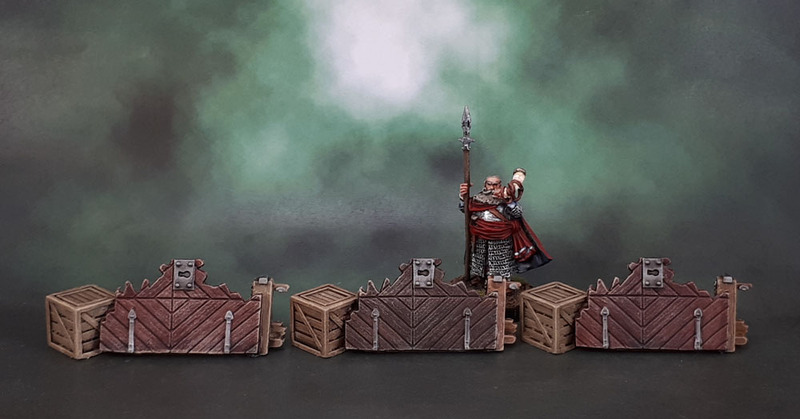 Mantic Terrain Crate – First bits of painted scatter. A few weeks ago I had my Mantic Terrain Crate Kickstarter pledge arrive. I basically got the “one of everything” pledge, so it was interesting to go through all of the bits and pieces, and see what came out nicely, what was warped and fixable, what was warped to hell, and what I could just start working on and knock out quickly and painlessly. Of course, I ended up mixing the pieces together without regard for which set they came from, since my intent was completely to work out which ones I wanted to paint first. Logs are pretty simple, but they work for what they are. Sure, you could do much nicer and more detailed logs with real wood, but these are nice enough and easy to paint. So they work for me. Similarly, bales of hay and wooden crates are fine. These single crates are detailed on 5 sides rather than 6, so they’ll always have the “grate” side on the top. I’m fine with that, but it’s just worth noting. The hay bales on the other hand are detailed on all six sides. The multi-crate stacks are pretty decent as well. 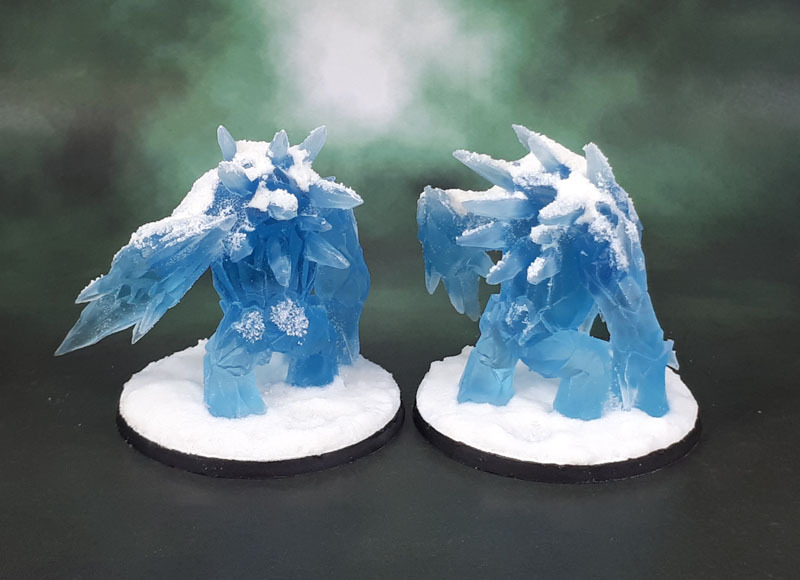 They’re like a similar but larger version of the old resin ones that were sold by Grendel (and probably others) since the 1990’s. 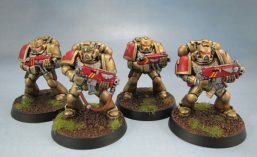 They’re pretty solid bits of scatter and can be used as background stuff in many genres of game or even as objective markers. I gave some of the individual boxes in the stack some (very) subtle differentiation with extra glazes of Flesh, Soft and Strong Tone, but wanted to keep them all pretty similar. Just enough variation so that the viewer doesn’t notice the variation while also adding enough small difference so that you don’t consciously notice that they all look exactly the same. 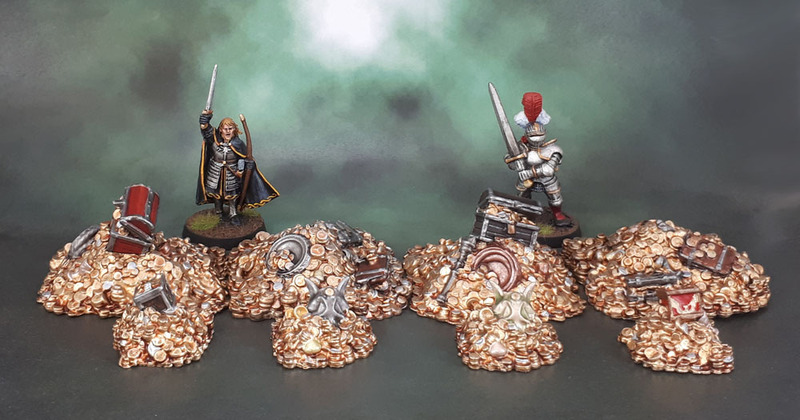 So while this might not be a super exciting post, and it’s certainly not a comprehensive review of the Terrain Crate stuff, but these pieces are the first that I’ve painted, and they’re all of solid quality – especially once painted. They’re not boutique resin-level quality, but for the price, they’re pretty nice. I’ll continue to offer my thoughts on the Terrain Crate stuff as I continue to work my way through them. More Star Saga scatter terrain today. Like the doors and crates before, I’ve bumped these up in the painting queue to use in Imperial Assault. The little tool boxes I painted in three different overall shades using different washes, so three of each if I ever need some more differentiated boxes, but they can just as easily be used as the loot crates as the ones I finished recently. The other things are these weird terminal things that appear to have computer screens and drawers. I guess they could be storage for pretty much anything with type-in access. Whatever – doesn’t matter. The finish on these are a bit beaten up and a bit dirty, though not overly so. Trying to find that balance that fits into multiple locations in the worn Star Wars universe, basically. IA has various red squares on the map that designate impassable terrain that also blocks line of sight. I thought these would work well for the “base/ship” style interiors to just 3-D the game up a little more. There’s also exterior ones that I’ll need to make something a bit more proper for, not to mention the interminable terminals that we need to use in every single mission. I’ll have to get started on some of those next.